One of the key challenges that businesses (especially marketers) face today is cobbling a set of systems together to gather the data needed to make informed decisions and take action. This blog post reviews how we connected our Marketing Platform (HubSpot) to our CRM System (Zoho) using BedRockData’s 3rd-party API available through the HubSpot Marketplace. The goal of this blog is not to promote any particular product or service (HubSpot does that quite well already), but rather to show others that connecting a set of systems is both possible and worthwhile. Frankly, most businesses are not willing to devote the time and go through the headaches to properly integrate their systems with APIs and 3rd-party tools that are, for lack for of a better word, esoteric. If you’re a HubSpot user and you’re already using Zoho CRM, your friendly sales rep at HubSpot is indeed being truthful when he says that HubSpot can be quickly and easily integrated into Zoho’s CRM with an off-the-shelf integration tool available from BedRockData. After reviewing this blog, you’ll be prepared to confidently integrate your HubSpot account with your Zoho CRM account using BedRock’s solution. Probably the most challenging part of syncing our online/marketing systems was making the connection between HubSpot and Zoho CRM so that we could send detail-level data back and forth between HubSpot and Zoho CRM. This proved especially frustrating because there aren’t that many tools that are designed with Zoho CRM and HubSpot in mind. Most API developers build tools that work with an instance SalesForce and a Marketo/Pardot. With the somewhat unique combination of our back-end systems, we had three options – hire a developer, leverage a 3rd-party tool, or just manually load the data on an ongoing basis. Since our data needs evolve and we need the data automatically synced, we opted for using the 3rd-party tool from BedRockData. It’s a pretty straightforward tool that allows us to select the fields that we want to pass back and forth between HubSpot and Zoho CRM, flip a switch, and let the API do its job. Before your cynical side rears its head, we did run into a few quirks along the way – as well as a learning curve related to “let’s click that button to see what happens.” Thankfully, the staff at BedRockData is very helpful and they spent several hours helping me to fine-tune our integration. 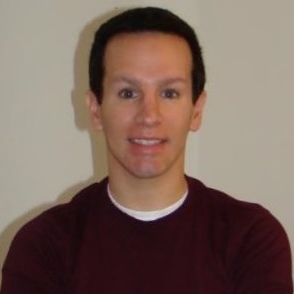 Special thanks goes to Ben Smith for helping us to get this API working smoothly. Ben and I exchanged nearly 20 emails and hopped on a few calls to get all the quirks ironed out. 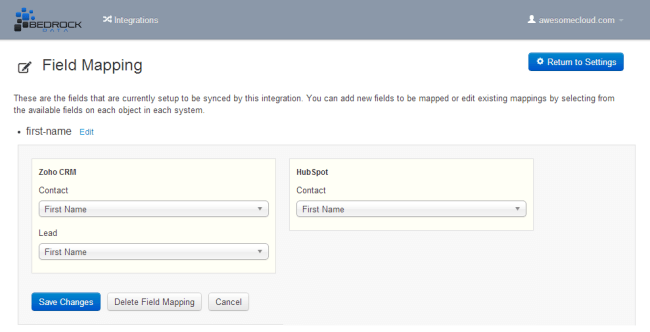 This is the main integration screen where you can setup and view your integrations. This is what the field mapping screen looks like. Select the field you want and click save. Cake. The nicest part about using BedRockData is that you can quickly and easily define the data that you’re passing back and forth between HubSpot and Zoho CRM. There’s no need to contact your developer to add or remove a field. It’s quite convenient, but there is a monthly cost associated with convenience. We found it beneficial to focus on using Zoho CRM’s fields as our starting point and then work backwards to push CRM data back into HubSpot because our sales team uses Zoho CRM as their primary system. Put another way, the only data we send from HubSpot into Zoho CRM is data that is pre-populated in HubSpot (Name / Email / Website Visits, etc.). All other data points, like Lead Status and Lead Quality, are created on the Zoho CRM side. We just port those data points back to HubSpot to kick off the appropriate workflows. Look at HubSpot as the repository of all your web analytics data and engagement information, not as your CRM. Your instance of Zoho CRM is where you’ll be making changes and edits. The changes that your sales team makes in Zoho CRM will be fed directly back into HubSpot and will then trigger automated emails and the like. That’s it! If you have WordPress and HubSpot and/or HubSpot and Zoho CRM, the above blog should provide you with all the information that you need to integrate your systems. Have a question? Feel free to drop me a line on twitter by using the @awecloud handle. I hope this blog was useful and that it saves you many hours of the grief that we have vicariously paid forward on your behalf. If you’re using HubSpot and WordPress, check out our guide on completing a HubSpot & WordPress Integration. When disaster strikes, what is YOUR plan for business continuity? You are absolutely correct that you should work from the CRM “back” to your other systems, as many times you want the CRM to be your system of record. We’re glad you’re enjoying the integration!